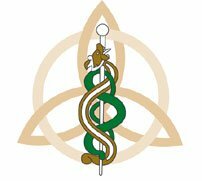 Our practice logo is a true representation of our practice philosophy: the fusion of the dental Asclepius symbol and the Celtic triquetra symbol. The staff of Asclepius is the traditional symbol of medicine used by professional and patient-centered health organizations around the world, including the World Health Organization. Asclepius is the Greek god of healing. The Celtic triquetra is a tripartite symbol composed of three interlocking circles. It is a perfect representation of the concept of “three in one,” or the mind, body, and soul acting together. In our practice we strongly believe that a doctor cannot merely treat the teeth of a patient, but must rather treat the whole patient comprehensively. Changes in the form or function of the teeth, muscle, joints, bone, or ligaments are interrelated and must be understood before any part of the system can be treated effectively. What affects one part of the human system will eventually affect the system as a whole. Dr. Freyne also knows there are commonalities among patients, but no two patients are the same. Therefore, time must be spent getting to understand each patient’s unique health needs and desires. This type of individualized, patient-centered care is what sets our practice apart from the rest.